See TCS CodeVita's Previous Year Questions! TCS CodeVita Season Five is here! Like four previous season TCS is strengthening its commitment to promote Programming-As-A-Sport culture. TCS has launched a platform called Anyone-Can-Code (https://campuscommune.tcs.com/channels/anyone-can-code) this time where you can practice programming problem. CodeVita is a team contest. A team must have 2 members. The contest will comprise of several rounds of coding. To participate in CodeVita, one needs to register the team. Both members of the team will need to register individually. The registration portal will provide necessary workflows to form the team online. Only a valid team can participate in the contest. Registration windows open up different times for different geographies. Refer your geography specific section for details on registration process. Practice Rounds: - Participants must use practice rounds to familiarize themselves with CodeVita website UI and also ensure that their workstations have compatible software that they can use for coding in Codevita. This is an optional, but highly recommended round to participate in. MockVita 1:- MockVita are equivalent in difficulty levels to CodeVita round 1. Quite likely MockVita will repeat questions asked in previous seasons of CodeVita. This is an optional, but highly recommended round to participate in. MockVita 2: - Same as MockVita 1. If MockVita 1 is on a weekday, MockVita 2 will be on a weekend or vice-versa. This is an optional, but highly recommended round to participate in. Round 1: The real CodeVita begins here. This is the first round of the contest. Top 300 or Top 5% of teams (whichever is higher) from the first round will move into this round. Round 2: Top performers from Round 2 will have an opportunity to reach the Finale. The list of Finalists is compiled only after all regional rounds across the globe are completed. Grand Finale: To be held in one of the TCSL offices in India. Top 3 teams will be declared as winners of the contest. Winners will receive exciting prizes, internship offers with CTO Team and provisional Offer Letters. Students will have to Register on TCSL NexStep for taking part in the contest. A CT/ DT Reference # is mandatory for participating in the contest. Each team can have only two members. Each team should choose a team name and the team leader. During registration, the team leader should Nominate self as the Team Leader and also Invite the team members. It is the responsibility of the team members to Accept the invitation. In case a team member rejects a nomination, the Team Leader will be able to send a new request to another registered member from same institute to join the team. The team will be formed after all invited members accept their invitations. The Team Leader of each legitimate team will be our point of contact for any further communication with respect to the contest and will be responsible for updating the respective team members. The team can be from the same discipline or may be inter-disciplinary. Team members of a particular team have to be from same college/institute. Team members have to remain constant throughout the contest. Swapping of participants within teams is not allowed and will lead to disqualification of the respective teams from the contest. The infrastructure / software(s) required for compiling code solutions shall be borne by the team or the institution they represent. TCS will not be liable for any damage to the institute’s infrastructure which may be caused by participants from the institute during the contest. CodeVita platform supports coding in 10 languages. 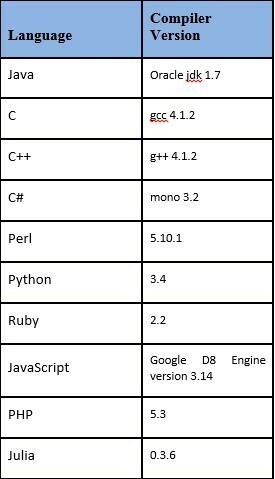 Language names and supported compiler / interpreter versions are mentioned in table below. Coding Guidelines will be provided as separate document. It will include information on scoring and ranking of teams in different rounds, list of URLs from which compilers and IDEs can be downloaded. Welcome to Phase 1 of the contest. Click on the Register button below to register yourself for the contest and start the Team Formation Process. This phase has closed now.. The real CodeVita begins here. This is the first round of the contest. Top 300 or Top 5% of teams (whichever is higher) from the first round will move into this round. This phase is now closed. Top performers from Round 2 will have an opportunity to reach the Finale. The list of Finalists is compiled only after all regional rounds across the globe are completed. This phase is now over. To be held in one of the TCSL offices in India. Top 3 teams will be declared as winners of the contest. Winners will receive exciting prizes, internship offers with CTO Team and provisional Offer Letters. *Winners will receive exciting prizes, internship offers with CTO Team and provisional Offer Letters. Find important tips and tricks! Quick quotes for your query! TCS CodeVita 2016: are you ready?